Congratulations to our colleagues at the Nottingham clinic, who completed a 7-mile London Bridges Walk on Sunday 12th July to raise funds for Kidney Research UK. This was the grand finale of a week-long purple themed fundraising event organised by the clinic. They raised a total of £439.65. The team led by Area Manager Rachel Hucknall and the Nottingham Clinic Manager, Adele Buttress, set out from Nottingham on Sunday 12th July at 0600 hours with colleagues and their families, including Caroline Neale, Kim Roome, Nicola Gabriel, Luminita Szabo, Sergu and Matt. They were later joined in London by the Managing Director, Mick Hartnett and his family. 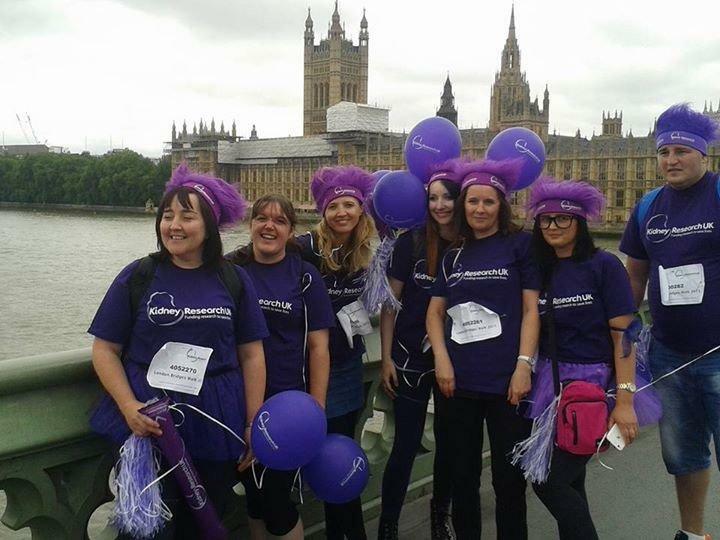 They were resplendent in purple t-shirts, walking boots and purple silly hats as they marched on with pride for patients, friends and families who are dealing with some form of kidney challenge. The London Bridges Walk took them through the whole city and was finally rounded up at the popular Potters Field Park with an emotional speech by children’s author, Jacqueline Wilson, who was recently diagnosed with kidney failure and is currently on dialysis. Kidney Research UK aims to support the three million people whose lives are at risk by funding research into the causes, treatment and management of kidney disease. By supporting the charity, we help people living with chronic kidney disease as well as their families. Next Post Traveling to Las Vegas as a dialysis patient? No problem!